This classic book from Jones has been resurrected with the days of small-stakes online poker running rampant. My views happen to fall right in there with Jones' advice and this is an important read for anyone frustrated with wild online games. Of course, I prefer no-limit but this is focused on fixed-limit games, which is mostly what beginners will start their poker career off with. Summarizing the style of play that Jones recommends, it is probably even tighter and even more aggressive than other conventional authors will recommend. Instead of writing from a high-stakes perspective, Jones writes about the gritty low-limit games that often leave otherwise good players baffled. Most importantly, he constantly warns of the dangers of slowplaying hands like trips or top pair. To succeed in these small games (which you can do and earn a consistently healthy profit), you need to realize that there is often little more logic in these weak opponents' plays than taking any possible chance to draw. While the book was written before the online poker revolution, you can easily compare the wild cardroom games discussed with loose online tables. This is a testament to tight-aggressive play and this will help to show you why you should play even tighter and even more aggressive online at small-stakes tables. 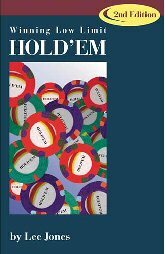 If you buy one book on limit Hold'em, this should be it.